Norland Norwell Log Cabin: The Norland Norwell Log Cabin is a beautiful traditionally designed cabin with a spacious interior and long front porch. There is an interior space of 18.7m/sq, with 70mm wall logs and double glazed double windows offering both natural light and the option of ventilation. The cabin has an attractive apex roof with a ridge height of 3.06m, creating a vaulted ceiling inside and a cover for the 1.5m deep porch area outside. The result is a cozy and quiet sanctuary suitable for many purposes and needs. The Norwell is both highly practical and visually appealing, offering plenty of functionality for its 5.2m x 5.4m footprint. 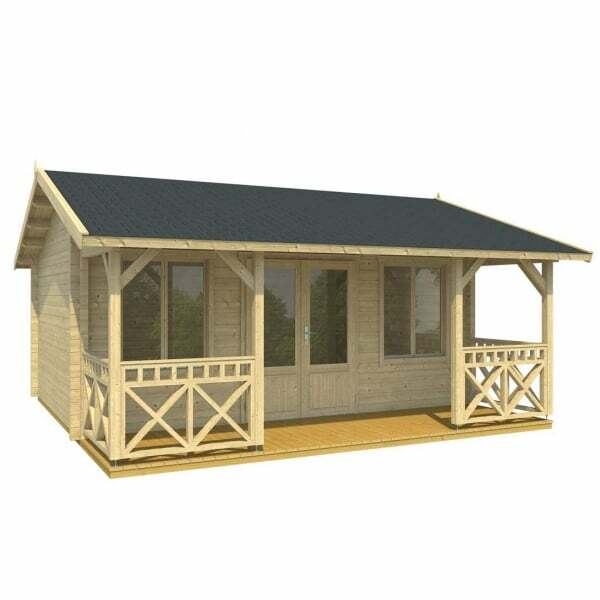 The Norland Norwell Log Cabin is easy to assemble and are an extremely sturdy structure as they are built in the traditional Log Cabin style and therefore uses no screws or nails in the wall construction. The Norland range also feature chalet corner jointing to give that extra timber jointing for extremely good weather resistance.